N�gr�d is the second smallest and least populated county in Hungary. It's a hilly area, with small villages in its valleys.� The two largest settlements are the capital Salg�tarj�n, and N�gr�d, the former county seat. There are numerous medieval castles in Nograd. One is the castle of Salg�, near Salg�tarj�n. The castle ruins stand on a a 625m high basalt volcanic hill - a unique opportunity to view two neighboring countries, as the hill sits on the border of Hungary and Slovakia. �Also interesting are the castle district of Sz�cs�ny and the Gothic Holl�ko Castle. 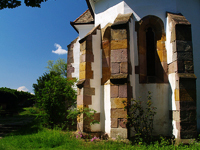 Those visiting Holl�ko Castle should spend a day in the old village of Holl�ko. A World Heritage Site, its peasant buildings are laid out in a comb-shape, with homes typical of a medieval village. With stepped gable roofs and wooden porches embellished with carvings, these houses remain faithful to the original style, and even the interior layouts are in 17th century three-roomed style. Standing nobly in the centre of the village is the 19th century Catholic church. Residents maintain their traditional garb with intricately embroidered pruszlik (bodice), bell-shapped underskirt and flowery bonnet. There is also the historic P�szt�, which has numerous museums and gothic buildings. One particular place of interest is "the House of the Schoolmaster", a preserved gothic civil house.